Commercial Street Spitalfields near Fournier Street, on the east end of London. Christ Church Spitalfields, lies on Commercial Street, E1, just outside the eastern border of the City of London, and was started in 1714 and completed in 1729. Its architect was Nicholas Hawksmoor. An Act of Parliament of 1711 established the Commission for Building Fifty New Churches which was to acquire sites and build fifty new churches to serve London’s new suburbs. 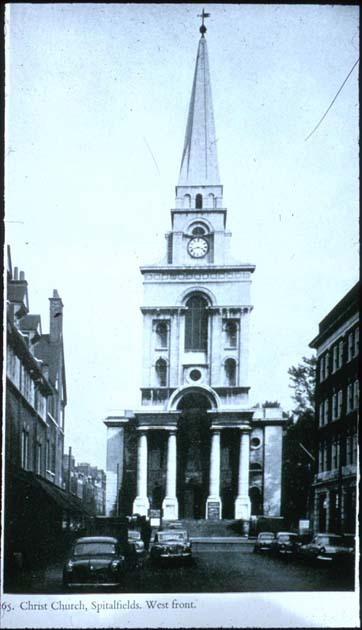 The Commissioners, including Sir Christopher Wren, Thomas Archer and Sir John Vanbrugh appointed two surveyors, one of whom was Nicholas Hawksmoor. 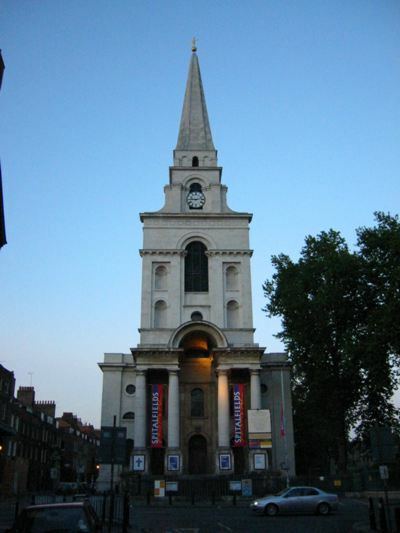 Of the planned fifty churches only twelve were built, including six designed by Hawksmoor. 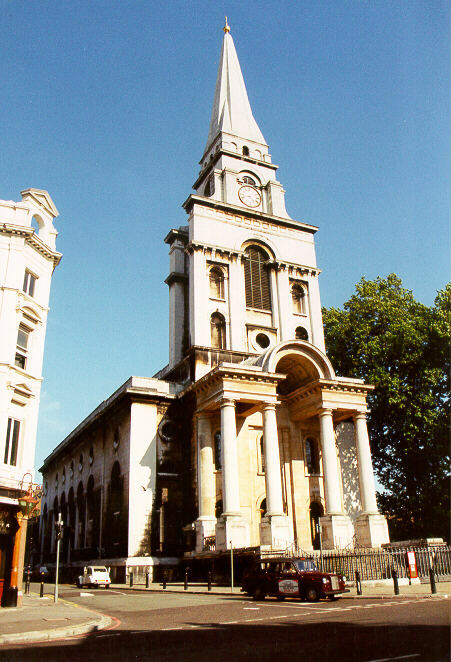 The architectural composition of Christ Church demonstrates Hawksmoor’s usual abruptness: the very plain rectangular box of the nave is surmounted at its west end by a broad tower of three stages topped by a steeple more gothic than classical. The magnificent Tuscan porch with its semi circular pediment is bluntly attached to the west end: it may indeed be a late addition to the design intended to add further support to the tower. 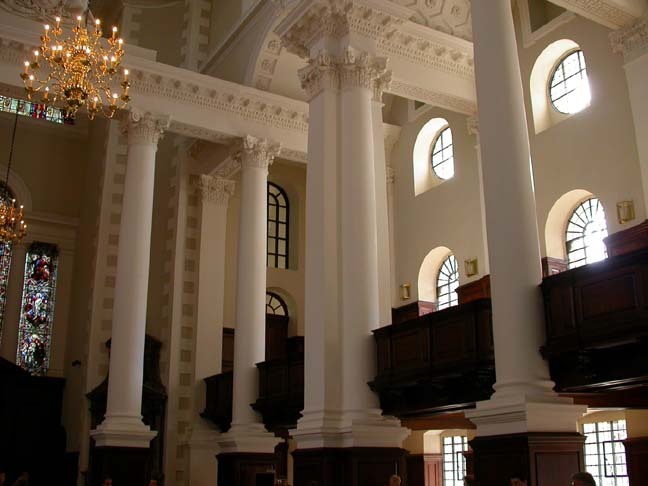 Like those of Hawksmoor’s other London churches and many of Wren’s, the central space is of the nave is organised around two axes, the shorter originally emphasised by two entrances of which only that to the south remains. It has a richly decorated flat ceiling and is lit by a clerestory. The aisles are roofed with elliptical barrel-vaults carried on a raised Composite order (cf. 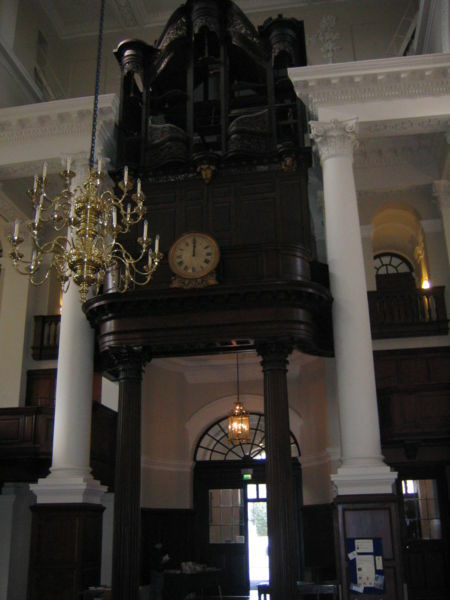 Wren’s St. James, Piccadilly), and the same order is used for the screens across the east and west ends. The Venetian window at the east may show the growing influence of the Palladians, or it may be a rhyme with the arched pediment of the entrance portico, repeated in the wide main stage of the tower. The church was savagely altered in 1850 by Ewan Christian (better known as architect of London’s National Portrait Gallery), who removed the galleries, blocked in the windows at the corners of the central space, and lowered the main windows. After years of neglect, in 2004 it was restored to its pre-1850 condition, working from the original building documents where possible. 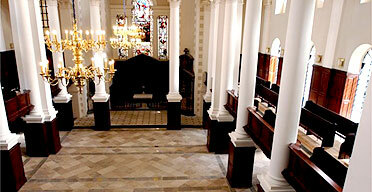 The restoration revealed the most complex and sumptuous of Hawksmoor’s interiors in London. The organ in the church was inaugurated in 1735, the work of Richard Bridge, a most celebrated builder of the time. With over two thousand pipes it was, when built, the largest organ in England, a record it held for over a hundred years. In the nineteenth century work was done at various times and further changes were made in the 1920s; remarkably, much of the original Richard Bridge organ survives. The organ became derelict and has not been heard in public since about 1960. The magnificent organ case, largely of walnut, and the completeness of the Georgian survivals make this a historic instrument of national importance. The organ parts were dismantled and removed for safe keeping and to protect them from damage during the restoration of the building. A scheme of conservative restoration is being prepared and fund-raising for it is already under way for it will be the crowning glory of the restored church. By 1960 Christ Church was nearly derelict and services were held elsewhere. 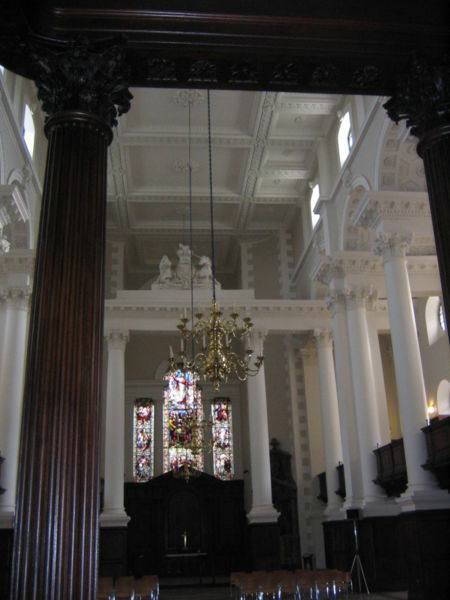 The Hawksmoor Committee staved off the threat of demolition and ensured that the roof was rebuilt with some of the funds from St John’s Smith Square. A rehabilitation centre for homeless alcoholic men was housed in part of the crypt. 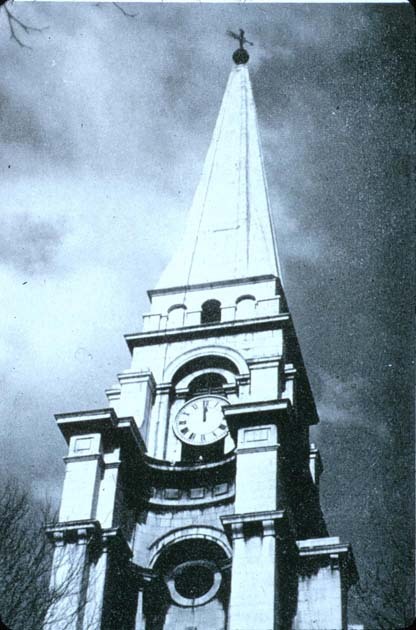 In 1976 the Friends of Christ Church Spitalfields was formed to restore the church and to bring it back into use: parish worship returned in 1987. The portico at the west end was repaired and cleaned in 1986, and the tower and spire consolidated and cleaned in 1997. The south façade was cleaned and repaired in 1999 revealing the striking whiteness and beauty of the Portland stone and the delicate detailing, both so quickly obscured by weather and city pollution. At the same time Hawksmoor’s magnificent double flight of steps on the south side, which was removed in the nineteenth century, was rebuilt. In addition, the gate piers of the Rectory yard were repaired and the large iron gates restored. The north and east façades were repaired and cleaned in 1999–2000. 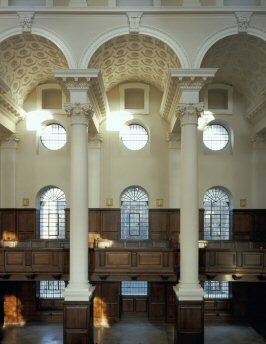 The restoration of the interior, begun in 2000 and completed in 2004, has restored the fabric of the church, removed the nineteenth- and twentieth-century alterations, reinstated the original arrangement of galleries, and recaptured the proportions, light and clarity of Hawksmoor’s original design. Spitalfields was the location of one of Roman London's large extra-mural cemeteries, situated to the east of the Bishopsgate thoroughfare, which roughly follows the line of Ermine Street: the main highway to the north from Londinium. The presence of a Roman cemetery here was noticed by the antiquarian John Stow as far back as 1576 and became the focus of a major archaeological excavation in the 1990's, following the redevelopment of Spitalfields Market. Perhaps the most spectacular find was the discovery in 1999 of a sarcophagus containing the remains of a high status, silk clad, Roman lady, complete with jet accesories and a unique glass phial. In the 12th century the former Roman cemetery became the site of the Priory and Hospital of St Mary Spital. This was one of the biggest medieval hospitals in England and was the focus of a large medieval cemetery which included a stone charnel house and mortuary chapel. This latter has recently been uncovered by archaeologists and preserved for public viewing. The Priory and Hospital were dissolved in 1539 under Henry VIII. The precincts of the priory were re-used as an Artillery Ground and placed under the special jurisdiction of The Tower of London as one of the Tower liberties. Spitalfields' historic association with the silk industry was established by French Protestant (Huguenot) refugees who settled in this area after the Revocation of the Edict of Nantes (1685). By settling here, outside the bounds of the City, they hoped to avoid the restrictive legislation of the City Guilds. In the 19th century the textile industry first established by the Huguenots attracted a large population of Jewish refugees drawn to live and work in the area. At this time the endemic poverty of this area came to the notice of social commentators such as Jack London in his The People of the Abyss. London highlighted 'Itchy Park', next to Christ Church Spitalfields, as a notorious rendezvous for homeless vagrants. Today, the housing stock of old weavers terraces to the west of Brick Lane has been gentrified by exponents of a 'New Georgian' ethos, causing massive inflation in house prices and the removal of the last of the vagrants from this area. Current 'urban regeneration' has also seen the erection of huge modern office blocks, between Bishopsgate and Spitalfields Market. These represent, in effect, an expansion of the City of London, northwards, beyond its traditional bounds, into this area.